Two suspects were seen running from a Mississauga restaurant in the moments leading up to a bomb being set off inside Thursday night, injuring at least 15 people. 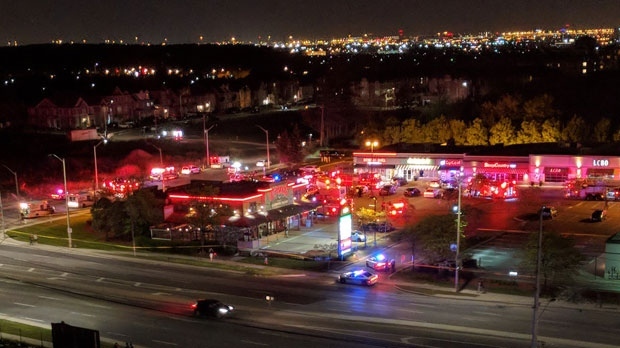 Emergency crews responded to the area of Hurontario Street and Eglinton Avenue at around 10:30 p.m. after an Improvised Explosive Device was detonated inside the Bombay Bhel, an Indian restaurant in the neighbourhood. Peel Paramedic Services said at least 15 people had to be treated for various injuries, including three people who suffered critical injuries. Roads have been blocked off in the area as officers investigate. Police have released a detailed description of who they are looking for. The first male suspect is said to be in his 20s, and between five-foot-ten and six feet tall with light skin and a stocky build. He was wearing dark-blue jeans, a dark zip-up hoodie with the hood pulled over his head, a baseball cap with a light grey peak and a black cloth covering his face. The second suspect is described as being about five-foot-nine or five-foot ten with fair skin and a thin build. He was wearing faded blue jeans, a dark zip-up hoodie with the hood pulled over his head, a grey t-shirt and dark-coloured skate shoes. He also was seen with his face covered. 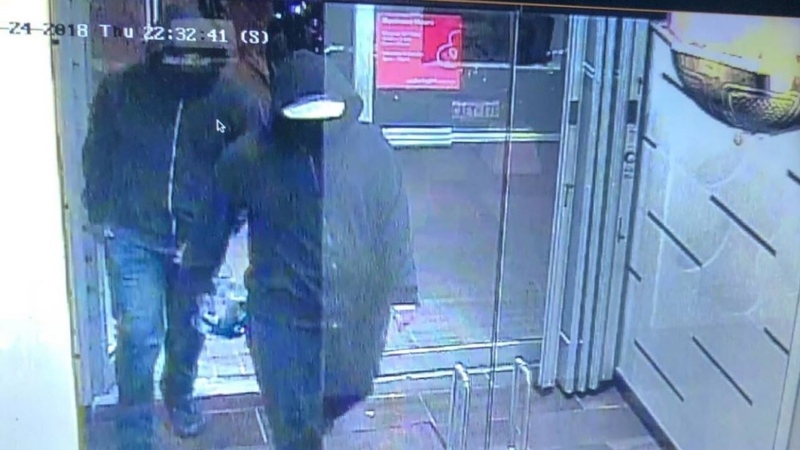 Two suspects who police say are connected to an explosion at a restaurant in Mississauga on Thursday, May 24, 2018, are seen in an image released by Peel Regional Police.